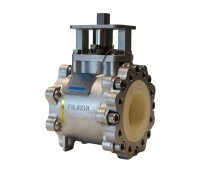 In 1975, Fujikin developed the first fine ceramic valve in response to customer concerns about conventional metal valves. Featuring fine ceramic materials with significant abrasion and corrosion resistance, Cosmix Fine Ceramic Valves have been sold around the world for over 30 years. The Fujikin Cosmix Fine Ceramic Valve exhibits excellent durability due to its ceramic materials, excellent flow control performance, floating ball structure for slurry applications, a lightweight design and ease of maintenance.